Minor corner dings. Name written on page edges. 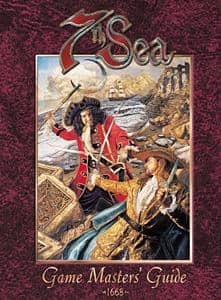 The perfect companion piece to the 7th Sea Player's Guide, this hard bound volume contains all the information a game master needs to run swashbuckling adventures in the world of 7th Sea. The GM's Guide contains everything from helpful hints to downright dirty tricks, plus a wealth of information on the world and its inhabitants.